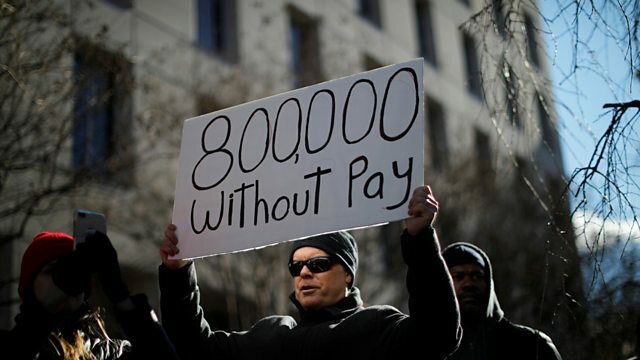 Hundreds of thousands of federal workers in the US have not received their January pay. Hundreds of thousands of federal workers in the US have not received their January pay. Trish Gilbert is vice president of the National Air Traffic Controllers Association, and explains how those working without compensation are coping. Also in the programme, proposals in India to counter the spread of fake news on social media platforms are causing concern among some technology firms. Prasant Roy is a journalist and media specialist in New Delhi, and tells us why the proposals are proving controversial. Scientists in the UK have come up with an innovation equation which they say can predict industries that are most likely to see the next big thing, like Uber. Dr Thomas Fink from the London Institute of Mathematical Science led the research, and describes how it sprung from his study of evolution. Plus we look back at the rest of the week's big business stories with Lianna Brinded, head of Yahoo Finance UK, and Sarah Ponczek, markets reporter from Bloomberg in New York.